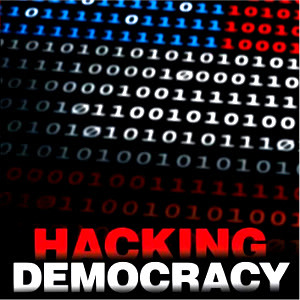 The documentary film, Hacking Democracy, asks important questions about the security of the VOTE in the United States of America by exposing the insecure, and fraud prone nature and construction of the software used in electronic computerized voting machines. The spirit behind Hacking Democracy is Bev Harris of Black Box Voting. Unfortunately, its unsure that we know if our votes count. Hopefully in the future, albeit unlikely, integrity can be restored to democracy. Voting machines have been proven to count votes backwards, and prone to a phenomenon known as negative votes. Its against the law to restore integrity to the election system. We aren’t allowed to investigate Diebold, nor see the software used to count our votes. We aren’t able to rely on the vote count result totals of a voting machine. There isn’t a way to verify that votes are counted correctly. GEMS is the software which counts the votes taken by the voting machines. John Kerry knew there was fraud in the 2004 Presidential election because he knew the optical scan machines in New Mexico would be putting out results for Bush no matter how the votes were cast or who the voters voted for. Polling tapes holding vote totals have been illegally discarded as trash by county employees in Volusia County, Florida.